There were 361 entries yesterday with 119 players through to Day 2. Kevin MacPhee, WPT LA Poker Classic finalist Richard Tuhrim, Noah Schwartz, Bernard Lee, Tom Marchese and Mike Matusow are also among the big stacks. 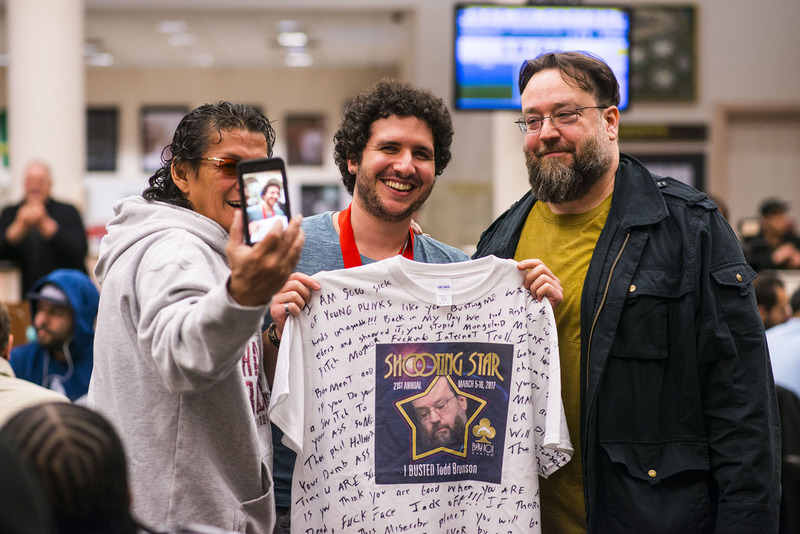 The $7,500 WPT Bay 101 Shooting Star will be swiftly followed by WPT Rolling Thunder – stages 2 and 3 in the new “WPT California Swing” that includes last week’s WPT LA Poker Classic – won by Daniel Strelitz. Last year’s WPT Bay 101 Shooting Star Main Event drew a record field of 753 entries creating a $5,346,300 prize pool. German student Stefan Schillhabel took it down for $1,298,000, his very first major poker tournament title after outlasting the huge field and a stacked final table. The $3,500 WPT Rolling Thunder Main Event starts March 11. The dates for the overall poker festival, which is being held at Thunder Valley Casino Resort, are March 8-15. Harrison Gimbel won last year’s event, beating Mohsin Charania heads-up for his first WPT title. There were 409 players with Gimbel taking $275,112 for first. The Florida native was fourth in the same event two years ago. Since 2004, the World Poker Tour has had a late winter swing through the state of California, starting with L.A. Poker Classic in Los Angeles followed closely by the Bay 101. When WPT Rolling Thunder was added to the tour in 2014, the WPT formalized this segment of the tour as the “WPT California Swing,” offering a Grand Prize to the player who accumulates the most WPT Cali Swing points.